This was from a class I took a couple years ago and new it was there because we made it in class. In one of my online food groups in which I am a part of a person was exclaiming that they could not find any Creme Fraiche so I went and typed this up for their benefit, with this work being done, I decided to share it here. Warm the Half-and-Half to 72 f/22 c.
Stir in the starter culture. Cover and allow to set (incubate) for 24 hours, until a very thick curd forms. Serve immediately or transfer to a storage container, cover, and refrigerate up to 1 week. Chef's note: Creme Fraiche is made by fermenting heavy cream that has a butterfat content as high as 60% with a lactic acid and the appropriate bacterial cultures. 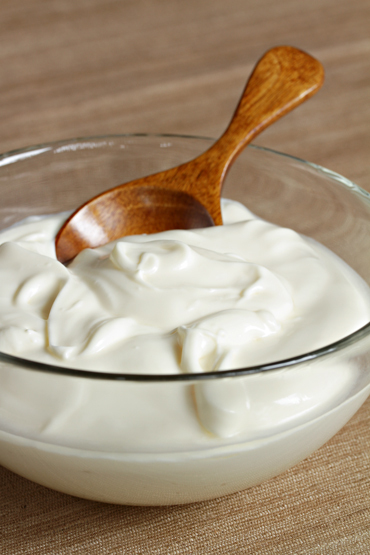 The flavor of a newly prepared Creme Fraiche is sweet, and has a loose, almost pourable texture. As it ages, the flavor becomes more pronounced and tart, and it thickens to the point at which it can nearly hold a spoon upright. It is important to the garde manger as a base or spread for canapes, in salad dressings, and served with fresh fruit. Variation: Lime flavored Creme Fraiche - add fresh lime juice to taste.